Thinking about publishing a book? Don't do another thing until you read "Publishing & Marketing Realities." It's absolutely terrific.I'd have saved a whole lot of time and energy (and money!) if I'd read this book before I started down the self-publishing path. Having just gone through the process of working with Lulu.com and then with CreateSpace.com and finally creating my own print-on-demand imprint, I can tell you that Christine Rose tells it straight. She's thorough, honest, and funny.This is no "feel-good-you-can-do-anything!" book. Rose gives you the unvarnished truth about how hard it is to publish. She might dissuade you. (If she does, you probably shouldn't try anyway.) But if after you learn what it takes you still want to press ahead, you will be ready. You'll have clear next steps and be eager to take them. I was thrilled to learn that many of the choices I'd made along the way were the right ones. I was stunned to learn how much I still didn't know. And I am forever grateful for the detailed lists of tasks/activities in the Appendix to use as I dive into marketing "Lily Hates Goodbyes" on a big scale. Holding your own published book is a surreal joy. You increase your chances of having that experience if you read Christine Rose's book. 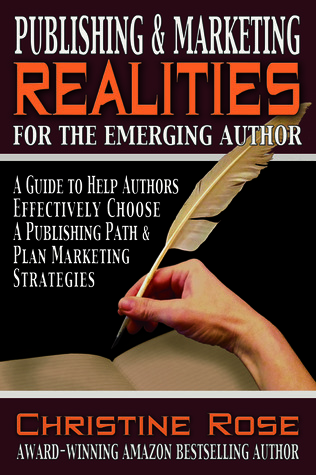 Publishing & Marketing Realities is the perfect book for the emerging author. If you're thinking about publishing--traditional or self-pub, Christine does a damn good job at breaking down things. She even breaks it down by indie press and will literally show you the steps of how to upload a Kindle book to doing a POD.The reason I didn't rate it higher is that I'm not an emerging author. Well, I am and I'm not. While I recently released my book a few months ago, I have spent years trying to get into the industry. I've queried agents and publishers, read the blogs and books, and listened to the interviews. I think if people at least do some of that, they'll be in the game a little bit.That's the problem with this book. If you're a completely newbie who lives in a vacuum and just writes, this book will be perfect for you. But if you pay the least bit attention to the things that go around you, you'll want more. At least, I did. I wanted more details into things especially marketing since no one knows who I am.That said, I still learned some things from this book that I'm going to try to put into use. A most excellent, no nonsense, resource for aspiring authors in this rapdily changing world of publishing. Whether you dream of seeing your name on the NYT Best Sellers list or merely want the satisfaction of seeing your opus in print, this book will spell out the steps you need to take. The good thing about Christine Rose's book is that she is telling the truth that she lived. The bad thing about this book is that, whether because the industry is changing too quickly or because Rose can only report on the way she's done things, it can be inconsistent, daunting, and overwhelming.I found a recommendation for "Publishing & Marketing Realities" on an agent's blog, which seemed like a pretty solid endorsement. Right from the start, I was surprised by Rose's definitively negative outlook on traditional publishing. It seemed to be a case of "the lady doth protest too much." Granted, her concerns seem valid--long, slow process designed to slow incoming writers down and keep them out--but that negative view from the outset tainted my perception of the rest of the book. She publishes through her own independent publisher, which she earnestly claims makes her something in between an "indie" publisher and a self-publisher, all while claiming that self-publishing no longer has such a stigma. Rose does an excellent job of listing out her perceived pros and cons of each style of publishing, and it was a great beginner's guide to an overly complicated system. I would have liked a more clear analysis of the amount of money she spent creating her own press and marketing herself. While she does drop dollar amounts periodically (and they all seem absolutely astronomical), it's hard to get a sense of how much she is spending, on what, and whether she is even seeing a return on her investments--or if we should all just stay home and learn basket weaving instead.The book really shines when it gets to the second part, explanations of all the marketing avenues available and how to use them. She has really done her research (though I had to laugh at the bit about how exciting a Kindle might be...while I was reading the book on a Kindle), and was extremely detailed in her how-to portions. It's a great synopsis of what's available (though, again, the industry is changing in great leaps and bounds right now). I'm glad I read her book, but... I'm not sure I trust all of her advice. There are some inconsistencies throughout that make me question whether this is a "how to" book (as it is advertised) or more of a personal memoir of how she did it. The detail she devotes to her cross-country caravan to sell her books (at a cost of $65,000; don't even get me started) is confusing when you realize later that she made more by staying local. Additionally, her schedule for marketing sounds exhausting, like a recipe for certain burnout. I'm okay with hard work, but this recommendation seems both expensive and improbable. There's just not a lot of "life" in her work-life balance. There doesn't even seem to be a lot of writing, for that matter. Her chapters on working a day job while performing all these writing and marketing activities also seems ludicrous...until she reveals that her day job is as an English professor at a community college. That makes a little more sense.I was also concerned about her revelations about her secondary persona, O.M. Grey. While earlier she says not to latch on to a trend just because it might be marketable, this is exactly what she does by adopting the Steampunk genre. I don't participate in that culture, but I would be pretty insulted by the way she talks about it, particularly the conventions. I believe she means it to be endearing, while also showing authors who haven't ever been to a genre con what it's like, but her teasing references to men in superhero costumes struck me as unkind. Furthermore, she seems to have adopted the trappings of the Steampunk genre just for money-making purposes; she doesn't seem to really "get" it. This rankled me; it seems to lack integrity to co-opt someone else's interests, but apparently she's been quite successful, so perhaps it is my compass that is wrong. In summary, this book has a lot of information, but whether or not it will actually be useful is going to depend a great deal on the reader. That said, I thank Ms. Rose for her courageous and thorough work on how-to-be-a-writer, and I'd like to gently recommend she take a short vacation. It will be good for her mental health, and I'm sure she needs the rest. If you want to be a published author, READ THIS BOOK FIRST! I have a large number of books in my library on the subject of publishing and marketing my books. None have hit home as Rose's book does. The book is the 'bible' for independent authors who don't understand today's marketing and promotion world. The author slams home the realities authors will face in getting their books to the reader, but offers real hope for those who are willing to see that technology is changing the book publishing and marketing world minute by minute! Buy it! Rose offers a tremendous amount of information in one, compact book. Much of the info is available by a quick Google search, but she weaves in her story for the reader to see that reality. I recommend this, especially for those going the self-publishing route. There are several places she repeats herself, not just in summation, but by simply repeating herself or inserting a blog post that covers the info she just wrote. 3 ½ stars. Not the best book I've read for Authors, it's certainly written in an up-beat style. There are lots of ideas and comments for authors but none that I found totally new. Probably best suited to a beginner. Fabulous book filled with a lot of great gems for anyone looking to publish a book.